You cut the grass. You water it. You add fertilizer to it. It gets plenty of sun. So what is up with the dead brown spots? Well, you may have a pest problem. There are a bunch of living creatures just below the surface of your yard. Some are actually good for your grass. Earthworms, for example, are a sign that your soil is healthy. Their presence means there is a healthy level of organic material in your soil. Earthworms should not be considered a pest. There are other critters that damage your grass. These include other types of worms and beetle larva. (Phyllophaga species) are the larva of the notorious Japanese Beetle. This creature is a pest from day one. These critters feed on the roots of grass and cause it to die. They also encourage moles and groundhogs just by being there because they are a food source. This bug also feeds on grass and roots and damage your lawn. They also release a chemical that prevents grass from being able to absorb water. This worm feeds on all organic material in the ground, including your grass and plants. It has a veracious appetite and reproduces often. It eventually becomes a type of moth. This worm turns into the brown moth eventually and in its larval stage feasts on your plants and grass. It will often leave plants skeletonized. Cutworms (pictured above) eat grass blades and are a prodigious pro-creator. They burrow under the grass and bite off the roots of your grass, causing it to wither and die. These are bad news for any lawn. 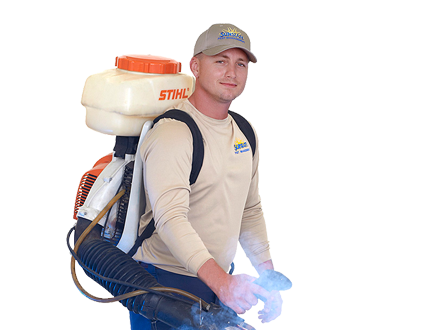 Call a pest professional about your pest problem and save yourself the headache.